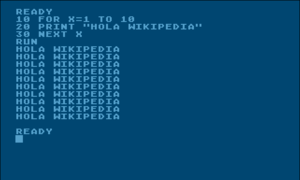 Screenshot o Atari BASIC, ane o the BASIC implementations uised bi the smaw an simple hame computers o the early 1980s. BASIC (an acronym for Beginner's All-purpose Symbolic Instruction Code) is a faimily o general-purpose, heich-level programmin leids whase design filosofie emphasizes ease o uise. ↑ "A Manual for BASIC, the elementary algebraic language designed for use with the Dartmouth Time Sharing System"
This page wis last eeditit on 19 Apryle 2017, at 05:45.